“I’ve never seen or even heard of an olive tea field before!” I exclaimed. “I expect ours is the first in the world,” Mr. Uematsu replied. “Some other Italians who visited us recently were also surprised.” Obviously, he has a boundless passion for olive tea. Mr. Uematsu cultivates the olive variety known as Nevadilo blanco. 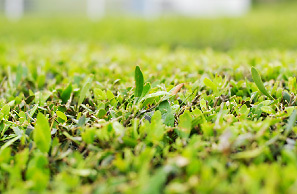 It sprouts many leaves and the young leaves are picked three times a year. As this prevents the shrub from blossoming, tea olives bear no fruit. Weevils, a natural enemy of this plant, are removed by hand. Olive tea is a refreshing beverage with a slightly astringent, bitter feel in the mouth. It tastes more like herb tea than green tea. The Yamahisa company sells bottled tea, tea bags and powdered tea and it’s highly recommended as a beverage for health conscious people. Olives were first cultivated in Japan on the island of Shodoshima where olive oil is now a popular local industry. Yamahisa Co., Ltd. is an olive oil manufacturer. 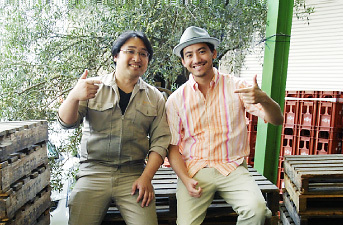 When the director, Katsuhisa Uematsu, invited me to join him for a cup of tea I agreed gladly! The tea he served was greenish gold with a slightly bitter, astringent aftertaste. When I asked what it was, he said, “It’s olive tea. We make it at our company.” Despite being from Italy, this was the first time I’d ever heard of olive tea. The olive fruit is famous for being rich in healthy polyphenols and vitamin E but the leaves have plenty of these nutrients, too. 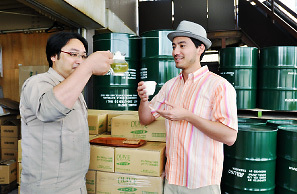 Mr. Uematsu, seeking to help people enjoy the olive’s health benefits, hit upon the idea of making the leaves into tea. At first he simply used the ones leftover from trimming but he found that mature leaves were tough. “I thought we could get a smoother flavor by blending them with the tender young leaves.” That’s when he decided to make an olive field specifically for harvesting young leaves. 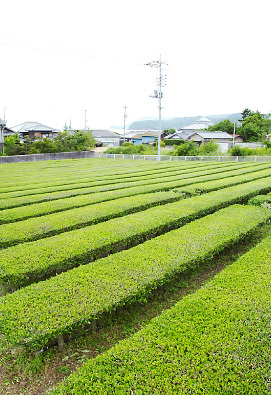 It looks just like a regular tea field but it’s lined with row upon row of neatly trimmed, waist-high olive trees. He introduced large-scale machinery and equipment so that every process from cultivation to the final product could be done in-house. 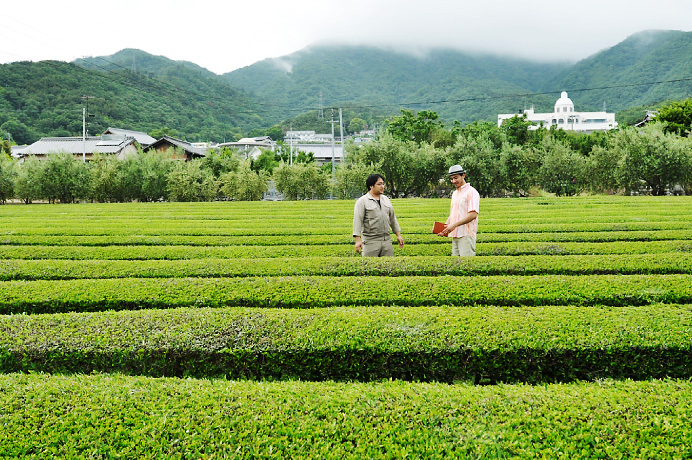 Yamahisa was the first company to make tea solely from olive leaves. This may start a new boom that opens up further possibilities for olives in Shodoshima. This looks just like a tea field but in fact all those shrubs are olive trees. A total of 90 hectares of land in two locations are now planted with trees that will be harvested only for their young leaves. Such strange shaped olive trees can’t be found anywhere else. Perhaps these fields will become the island’s next tourist attraction. Stirring with these long paddles is hard labor. The contents must be thoroughly mixed so that what’s on the bottom comes to the top. This supplies air to the moromi, accelerating fermentation. Once fermentation is underway, the moromi practically overflows from the vats. Moromi peacefully ferments in the warehouse to the strains of recorded Japanese harp music. From all around I can hear little popping and fizzing noises, as if the moromi is talking and breathing. 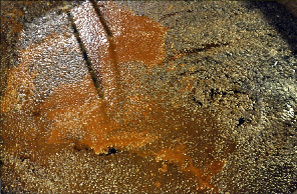 The main business of the Yamahisa company is making soy sauce. Full of gas from the fermentation process, the moromi bubbles and swells like a chocolate muffin. “Would you like to try stirring?” Mr. Uematsu asks, handing me a long paddle. The footing is slippery and my head is dizzy from the smell. Glancing into the neighboring warehouse, I see that they are pumping air into the moromi. Now wait a minute! Is that fair? “We have so many cedar vats to stir, you see. So we do it like that, too.” While in the warehouse, I noticed that they were piping in BGM. It was Japanese harp music. “You must have heard that playing classical music in wineries helps the wine mature. Well, our company president decided that as soy sauce is an ancient Japanese product, we should play traditional Japanese music. We’ve been doing this for 25 years now.” Regardless of whether or not it’s effective, it certainly shows that the manufacturer is dedicated to making the best moromi. It also shows a willingness to try anything for the sake of good soy sauce! Those were my thoughts as I listened to the music. 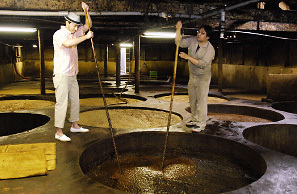 At Yamahisa, soy sauce is fermented in tanks as well as in wooden vats. Here we are standing between the tanks. Apparently, Yamahisa soy sauce was featured in the popular cooking manga Oishinbo (The Gourmet). I’ve got to read that! Characteristics: 100% olive leaves cultivated on the Yamahisa farm without chemical fertilizers or herbicides. Olive leaves contain calcium, iron, vitamin E and plenty of polyphenols. Helpful for maintaining good health.